Technology has proven to be a casual and helpful part of everyday living. The various types make it easy to connect and communicate with people around the world. Work, personal, and social living are enhanced by the vast contributions of technology. Glendale retirement facility residents may often feel isolated or disconnected from their family and friends. There are several ways that technology helps seniors remain connected with friends and family. It helps to fill the void that exists due to the distance and separation from their loved ones. For most, technical devices seem foreign and can be a little intimidating at first. There are many ways to introduce technology to those who aren’t comfortable or familiar with it. Classes, one-on-one tutorials, or simply playing around with devices help seniors to become comfortable with laptops, smart phones, tablets, and other technology. Here are a few ways that technology can help seniors stay connected with family and friends. 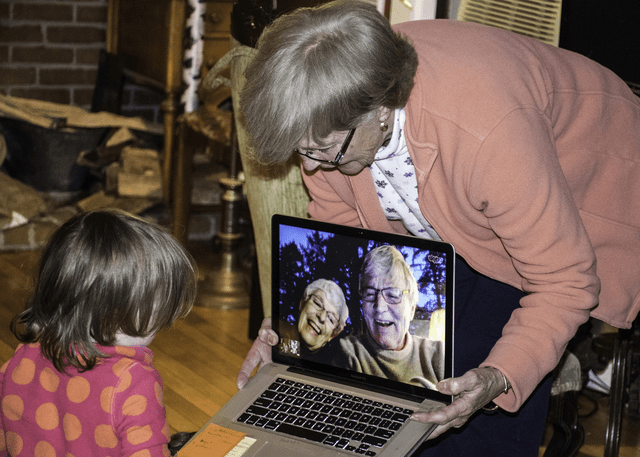 Skype, FaceTime, and other video calling technology makes it easy for seniors to see and talk to their loved ones. These communication methods are available via technical support devices such as phones and laptops. A few minutes is all it takes to show aging adults how to connect with those they love. It is also a great way to allow them to join in for special announcements or celebrations that they can’t attend. Glendale nursing home residents can stay connected with their friends and family by logging in and connecting with their loved ones. Managing health and wellness of seniors is increasingly easier for seniors and their families. Online dashboards and medical records make it easy for authorized users to access medical history and treatments. This means that adult children and loved ones can keep track of their senior loved one’s medical treatment and status. Health forms can often be completed online. Adult children can assist with the completion without attending the appointments with their aging loved ones. Seniors who do not reside in a Glendale nursing home can find comfort with technology that connects to their home. Motion detectors, pressure devices, and appliance monitors are ideal for senior homes. A motion detector can alert the senior and emergency personnel of an intruder in the home. In the event a senior may fall inside the home, pressure pads send out an alert to others. Stoves and other electronics are dangerous if left on when not in use. Appliance monitors can alert if the stove or other component has been on for an extended length of time. There is also the possibility to connect beds to monitors. These devices can monitor movement, pulse, and other vitals of the senior. Broadview Residential Care Center provides access to technology for seniors. Contact us at (818) 246-4951 to learn more about our approach to technology for senior living.